Before suffering damage to my brain and central nervous system, I was much pickier about what I chose to read. I was, in fact, limiting myself to the well known authors – King, Crichton, Cook, Patterson, and Baldacci. I also stuck to the same genres – medical thrillers, courtroom drama, post apocalyptic anything. Spending the last 7 months in bed has changed me as both a person and a reader. Early in my recovery, reading anything for more than a few minutes was difficult. As that symptom has faded, I find myself wanting not to just read, but to explore. To pick things the old Sue would not have chosen, to discover new worlds and expand my mind. I will walk the library shelves and pick up a book, and with only a brief scan, check it out and take my chances. I am so glad I stumbled upon “Me and You” waiting quietly for me to select it from among the thousands of other choices before me. This is a small book, only 153 pages, and even sized differently from the standard book dimensions. Much smaller and unique. The same as the story inside – short, concise and powerfully different. I never like to give away too much plot specifics in these reviews because I feel that cheats the reader from learning details themselves when reading the book. 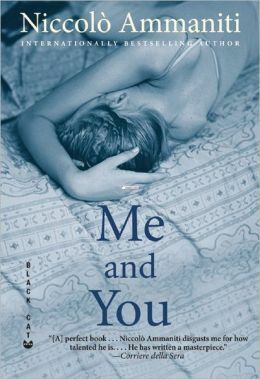 So, in the briefest possible way – “Me and You” is a coming of age story for a young 14 year old boy who doesn’t fit into society and is abnormally attached to his overbearing Mom. Trapped in a lie he doesn’t understand why he told, he ends up hiding out for a week where he then becomes deeply connected (not in a weirdo kinda way) with his barely known 23 year old half-sister. Ammaniti tells a good story – the picture of what happens during this time is well crafted and becomes life like for the reader. One thing I often do not like is an adult author attempting to voice a teenager. Ammaniti writes his characters voice very accurately and believably. Being such a well written short novel, I was able to read this in one day. When I closed the book for the last time, there was literally a moment of quiet. I was affected. This is a story worth reading and I highly recommend an afternoon spent between its covers.